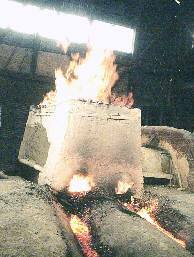 �@Japanese traditional iron manufacturing method is called "Ta-ta-ra" As this method which uses the iron sands and charcoal manufactures iron at lower temperature, the pureness of processed iron is very high and higher quality steel is created from this iron. Japanese sword is made by only this iron as base material. In these days, iron as base material for Japanese sword is manufactured with only one "Ta-ta-ra" facility which is at Yokota in Izumo area where is located into mountain, in winter of the coldest season. This facility is called "Nittobo-Ta-ta-ra". This facility is maintained by Society for preservation of JAPAN art swords which is main sponsor with Hitachi MFG. 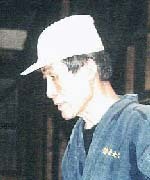 Mr.Akira Kihara (Murage) with ten and half people have kept the traditional technique in this facility. 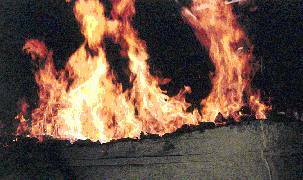 Ta-ta-ra on forth day from start-up-day Burning Fire Murage who has whole responsibility for Tatara works. Wemen who step Ta-ta-ra(Foot bellows)is the music used in the movie titled "Princess Mononoke"which is presented by "Ponta". One step and two steps, a child do that so. Three steps and four steps, an ogre does that with tears. Wemen of Ta-ta-ra has warm heart. Iron melts itself with it and change into the sword.